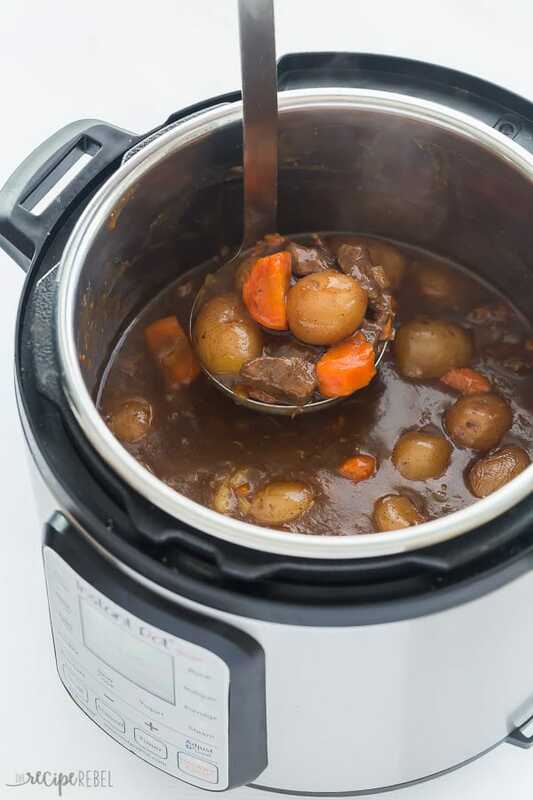 This Honey Balsamic Instant Pot Beef Stew is the BEST pressure cooker beef stew you’ll find! The sauce is rich and tangy and just sweet enough — you’ll never go back to your old stew recipe! This Instant Pot beef stew recipe has been a long time coming. Slowly but surely, I’m converting some of my favorite recipes (and yours!) over to the Instant Pot, as I’m getting more and more requests for them! 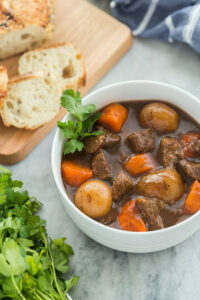 The Honey Balsamic beef stew was originally a slow cooker recipe, and it knocked my socks off. I’ve never been a big beef stew lover, but the sweet and tangy honey balsamic combo, it has so much depth of flavor and it totally won me over. This is not your usual boring beef stew! I’m confident it will win you over too! If you do try it, be sure to share a picture on Instagram and #thereciperebel, or share it in our Facebook group! Hearty, healthy comfort food is our jam over here, and based on the popularity of this Instant Pot Pot Roast, Creamy Italian Instant Pot Chicken Breasts, and this Instant Pot Potato Soup, among others, I know you’re on board! If you’re just starting out and looking for more easy Instant Pot recipes, start with this post on How to Cook Frozen Chicken Breasts in the Instant Pot or this Instant Pot Pork Tenderloin recipe. Start by browning your beef. This step isn’t totally necessary, but it gives the meat a ton of flavor and keeps the gravy from being “watered” down by all the beef juices. Brown bits on the bottom of your Instant Pot? Totally fine! Add the broth next and give the bottom a good scrape with a wooden spoon. This is important because it will prevent you from seeing the burn notice that happens when you get food stuck on the bottom of the Instant Pot. Add the rest of your vegetables and seasoning, and give it a stir. Turn to manual or pressure cook, high pressure, and cook for 20 minutes. *Note that your vegetables will be quite soft after this time, even if they are whole potatoes and large chunks of carrots. If you prefer your vegetables to be firmer, you can set the Instant Pot for 15 minutes, then add your vegetables and cook for 5 more minutes. Stir in the rest of the sauce/gravy ingredients to thicken those beautiful juices — serve with crusty bread! This recipe is naturally gluten-free and dairy free, but be sure to check all of your package ingredients. This recipe is obviously not vegetarian, but if you wanted you could substitute the beef for some sauteed mushrooms and I bet it would be amazing! Feel free to switch up the veggies for ones you love — just keep the cooking time in mind. Some vegetables that cook quickly don’t go over well in the Instant Pot because they turn to mush, so just be mindful of what you’re putting in there. I use a 6 quart Instant Pot with wifi — I know that some of the newer models and the 8 quart models have a higher minimum liquid requirement but mine calls for minimum 1 cup, and I’ve never had any trouble with it coming to pressure. You don’t have to brown the meat first, but it adds great flavor and I find it doesn’t release as much of the juices into the sauce as it would otherwise. Do not cut your vegetables too small. Normally, I do little or baby potatoes for 3-4 minutes total and they are perfect. We don’t want them to turn to mush! Everything cooks very quickly in the Instant Pot. 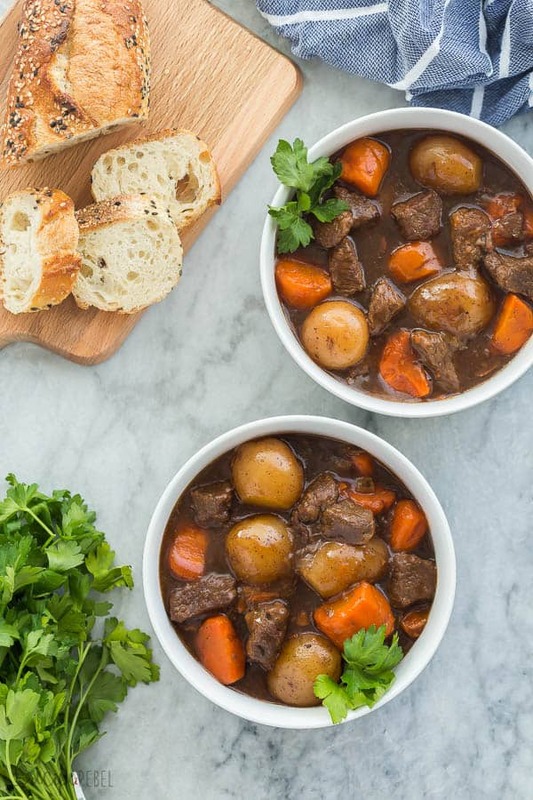 Can I make this Honey Balsamic Instant Pot Beef Stew with frozen beef? You can absolutely make this recipe using frozen cubes of beef! It will work best if the beef is in separate cubes, and not stuck together in one chunk. If it is in one big chunk, my best advice would be to thaw it and continue with the recipe as written. If you have frozen cubes of beef, you will skip the searing and add 3-5 minutes to your cook time. Can I make this pressure cooker beef stew in the slow cooker instead? This honey balsamic Instant Pot Beef Stew is based off of my very popular Honey Balsamic Slow Cooker Beef Stew. This Honey Balsamic Instant Pot Beef Stew is the BEST pressure cooker beef stew you'll find! The sauce is rich and tangy and just sweet enough -- you'll never go back to your old stew recipe! Turn Instant Pot (I use a 6 quart Instant Pot) to saute and wait until it says hot. Stir together salt, garlic powder, pepper and paprika. Season beef with half of the seasoning mixture. Add oil and a single layer of beef cubes (you may have to do this in two parts). Cook on each side until browned, about 2-3 minutes. Turn off the Instant Pot, and add broth to the pot while it is still hot, scraping the bottom well with a wooden spoon to prevent any bits from sticking. Add potatoes, carrots, onion and celery to the bottom and sprinkle with the rest of the seasoning. Stir. Put the lid on, turn the valve to sealing, and select manual or pressure cook for 20 minutes. It will take 10-15 minutes to reach pressure and begin counting down. When the cook time is over, turn the Instant Pot off and let the pressure release naturally for 10-15 minutes before opening the valve and removing the lid. Turn the Instant Pot to saute. Whisk together balsamic vinegar, honey, corn starch, tomato paste and Worcestershire sauce and add to the pot, cooking and stirring for 2-3 minutes until thickened. Serve. *I prefer to cut my own beef stew chunks from a less expensive roast. You'll pay a premium for stewing meat just because it's a convenience item, so you can usually get twice as much roast for half as much money if you're willing to cut it yourself. This stew is so comforting & delicious! It’s one of my favorites!! I love how easy and hearty this dish was – so much flavor! I couldn’t believe how easy this recipe was! The meat was so tender and tasty! Thanks Steph! I’m so glad to hear it! Love hearty stew recipes like this! Thank you!